To get started with GitHub authentication, you first need to register a new GitHub application. Fill in the form, providing the name of your application, a homepage URL and optionally a short description. Click the Register application button to complete your application registration. When the application is registered, you can access the Client ID and Client Secret at the top of the application details page. Now browse to the Gluon Dashboard web application. 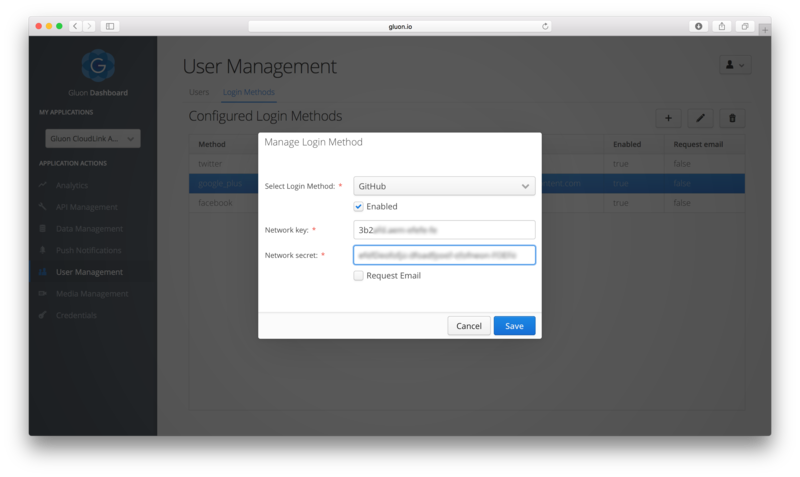 Navigate to the Login Methods tab on the User Management link, click the + button, and add a new GitHub login method from the drop-down list. From the GitHub application, copy the Client ID and the Client Secret, and paste them into the Network Key and Network Secret fields respectively, and click the Save button to apply your changes.